The focus of this tutorial is to show How to Migrate Users and Groups With ACL Permissions in AEM from one server to another or from one AEM instance to another in project. In a real time scenario, Most of us used to have multiple CQ Publisher instances in different environments (DEV, QA, PROD, etc.). And for testing purpose we want to keep all environments in sync . In such scenario, you have to copy over both user group and the acls permission to lower versions like (DEV, QA, PROD, etc. ), that we are going to learn in this tutorials and trouble shoot most of the common errors or mistakes that you might face. 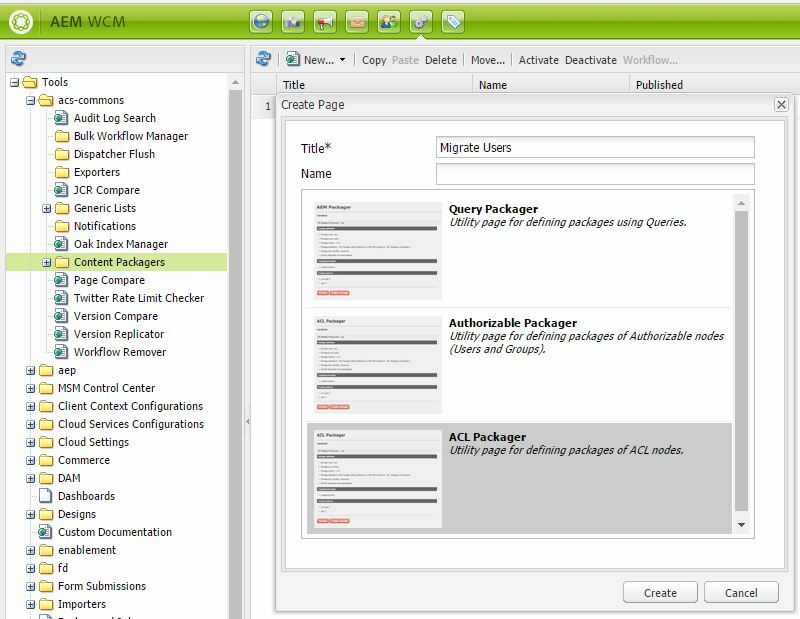 There are two ways to migrate user and groups with ACL in aem, the best and simple approach is to use acs common package. 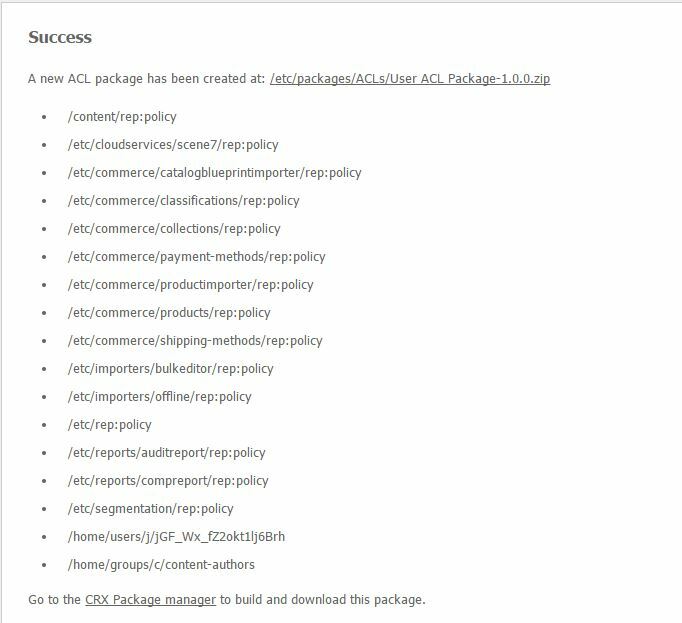 Migrate users using ACL Packager from acs common package. Before starting to migrate user and groups its important to understand what do you mean by rights, acl permissions and privileges and where they are stored. Navigate to User Admin Console(http://localhost:4502/useradmin). Double click any user and go to permissions tab. Below diagram explains it in detail. More Privileges can be added at node level as per requirement. Login to AEM author instance. Under the content packagers folder, create a new Page using “ACL Packager” Template. There are 3 template available under this folder. Query Packager – Utility for creating package using queries. Authorizable Packager – Used to Migrate only User and Groups (only authorizable nodes). ACL Packager – Used to Migrate User/Groups with acl permissions from any where under root node. (authorizable nodes + acl nodes). 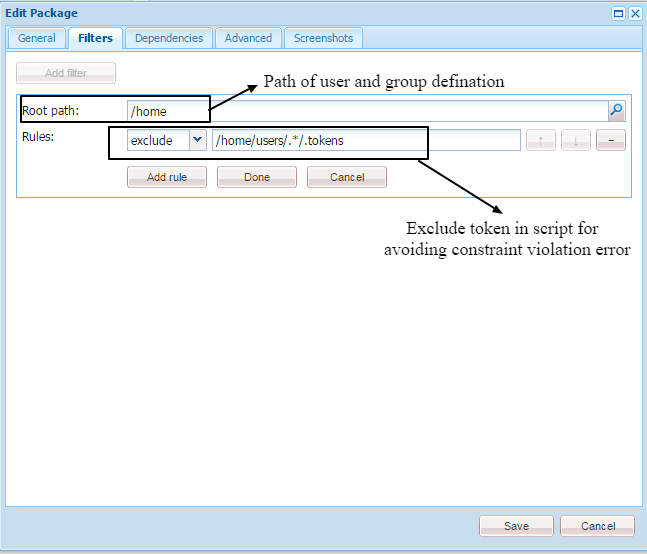 Edit ACL Packager Configuration rules and configuration, as shown in below screenshot. and click OK.
Click Preview Button, to view the filter paths that are included as part of this package. Once you are satisfied with preview results, click on Create Package button. Go to crx package manager and download your package, so that it can be installed on other instance where you want to migrate users and groups with acl permissions. Congratulations you have successfully created User and groups with appropriate Acls permissions. 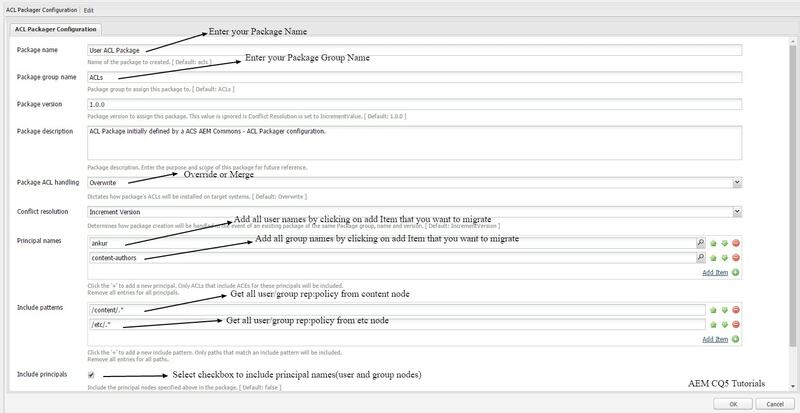 For migrating or copying users and groups definition from one AEM instance to another, we follow the approach of creating a package of users/groups definition , then install the package to the destination AEM instance. Note :- Take a back of existing User/group definitions . By adding /home in filter. Go to crx package manager. 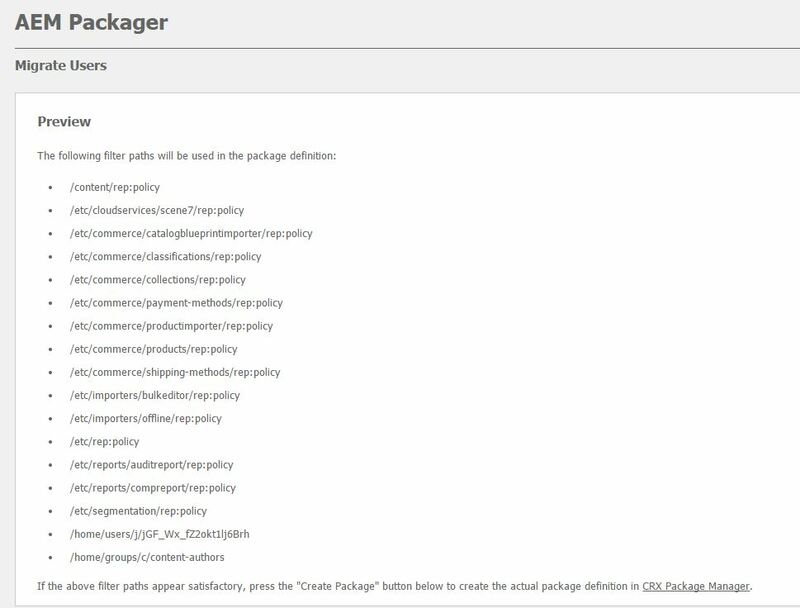 Create a new package and enter below details in Filters tab. Note:- If we don’t exclude tokens then we will get jcr constrain violation exception as shown below. Add one more exclude rule to remove admin user and replication-receiver user, as these users has lockable node property hence cannot be copied on destination instance. If still you are getting same error check where admin user is stored in destination instance and exclude that path also. Add rep:policy to include permissions of individual nodes as a part of package. 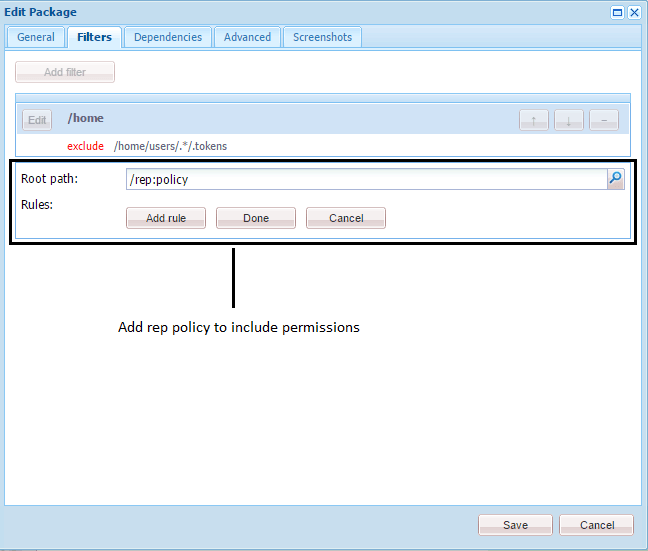 Note:- Add all rep:policy nodes where you have stores the permissions like /content/rep:policy. Go to Advanced tab and set ACL Handling to overwrite from dropdown. Build the package and click download. Your package is ready upload it on new AEM instance and your users and groups will be migrated with appropriate Acls permissions. Always take a backup of /home folder at both instances. Same user should not be present on both instances else it’s password will be overwritten. The above method will replace users and groups with Users of new instance, if users are present on destination instance which are not available at source instance then they will be deleted. To resolve it take a individual backup of users and groups in a separate package and run this package on top of our package. Note:- Above method replaces users and groups folder to destination instance. Carefully use exclude scripts. 24 Responses to "Migrate Users and Groups With ACL Permissions in AEM"
Appreciate you for creating this highly useful article. In reality, developers will be faced with the requirement of moving a few users and groups with their ACLs. Please suggest this procedure too. I have updated the post for moving few user and groups using ACS commons package. I have updated the post, now it will work fine for both 6.1 and 6.2 using ACS commons package. I have experienced similar issue with AEM 6.1 , got got the users but not the permissions and ACLs. I believe you also need to utilize the acs-commons ACL package to migrate the ACLs themselves. The above method will only migrate the users + groups, not the ACLs. I’m using AEM 6.2 and I managed to export the permissions with this tutorial. but, I put only my directory on filters, like that. I have experienced similar issue with AEM 6.1. The groups got migrated but the groups permissions and with ACLs is not migrated. help me out if anything extra steps needs to be taken care. Hi kk, please use new approach of using ACS commons acl packagers. It is great blog, but i have a confusion as we are excluding the ‘admin’ and ‘replication-receiver’ user from package. I got the same exception as described by ‘Kk’. so i removed the exclude rule of ‘admin’ and ‘replication-receiver’ and build again that new package installed correctly with all ACL permissions. Can you please check is there rules change in OAK. Sure i will do it, Which version of AEM you are using ? Is there any way we can add all rep:policy in our package without selecting each rep:policy in root path? Let me know if you have thought on the same! Hi Guna, yes you can achieve the same using acs commons package. Do you know if there is a limit of users that we can add in UserAdmin? I have a legacy 5.6.1 where the number of users nearly 30K. Every user has some custom role. So the role node is really large and takes a lot of time to save the data. We plan to upgrade to AEM 6.2 and wondering if we could move all the users? Right now, there is no limit as such. It was working fine in my local machine but not in my QA instance. I did some replication in my local aem instance and after that while opening the migrate user page i am getting internal error. I have already tried the ACL Packager approach. It is still not working in 6.1. I followed the instructions and installed the generated package to the new AEM server but still, the permissions were not imported. Please help. Hi Ankur I am using AEM 6.2 after creating the package,the groups got migrated but the groups permissions and with ACLs is not migrated.Can u please help me out for this . Have you used acl packager from acs commons ? If not then i advised you to use that as shown in the tutorial. I have created ACL package for user groups migration in AEM 6.0 and while installing the package in AEM 6.3 instance im getting the below error can u help me with this.